Gongura Chicken Recipe is an amazing combination of gongura leaves or sorrel leaves with chicken and is a special andhra style recipe which is made commonly in the andhra region of south india. 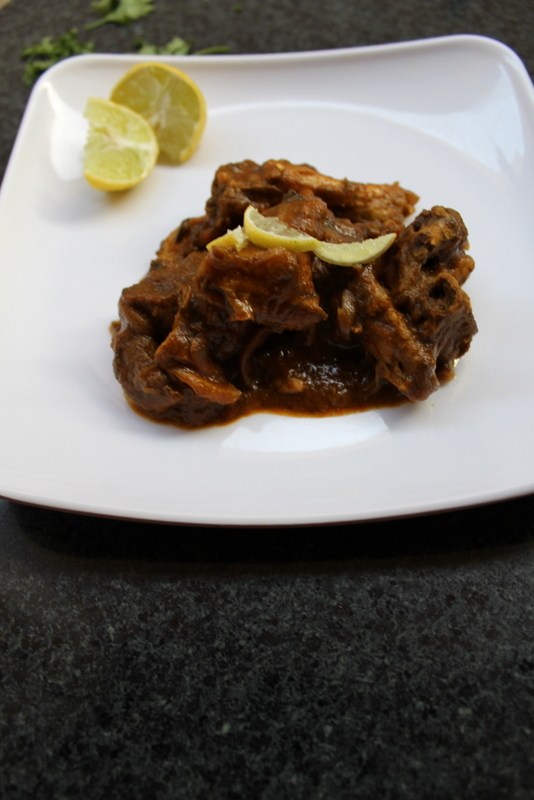 Gongura mutton too is a traditional dish in that region as gongura chicken is. In this recipe I have used red stem sorrel leaves but one can also use green stem sorrel leaves. No matter which kind of gongura leaves one uses, the sour taste can be balanced by using green chillies and red chilli powder. That is one main reason why we add green chillies or red chilli powder in gongura recipes to reduce the sour taste in them. Some more chicken recipes to be tried are: chilli chicken, chicken liver fry, chicken manchurian, chicken pulao, chicken cutlet, tandoori chicken, kfc chicken popcorn. In andhra region of andhra pradesh vegetables mainly green leafy are used in variety of ways and the green leafy vegetables are cooked in the form of saag and enjoyed with steamed rice. Along with that chutneys and pickles are used as accompaniments. 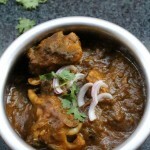 This gongura chicken recipe posted here is surely a delicious one which is simply irresistible. The recipe is prepared by separately cooking gongura and blending into a paste and adding into the chicken and cooking it together which brings a wonderful taste to the complete dish. Andhra cuisine is an amazing cuisine and me especially coming from south indian background and a hyderabadi too has picked up the food culture of certain south indian regions and I am sure that is going to reflect in my posts in future. I have learnt to make many kinds of gongura recipes such as gongura mutton, gongura chicken, gongura chutney, gongura pappu etc…which are so traditional and tasty too. 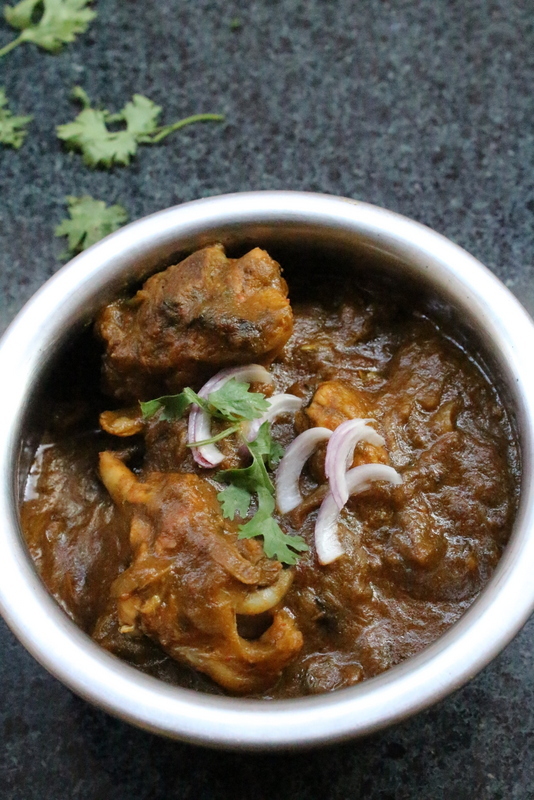 This gongura chicken curry is surely a hit in my family and I am sure the same would be from my blog readers too when they try this recipe. 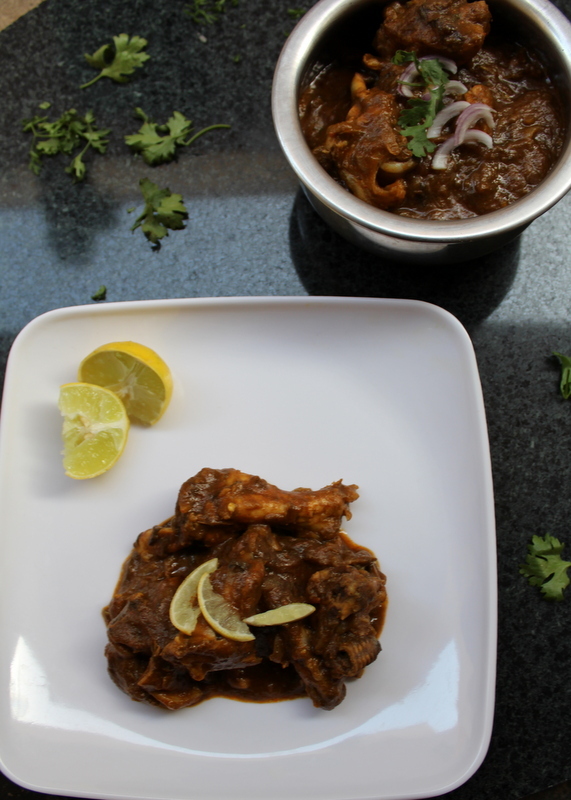 Do check out gongura chicken recipe and the leaves are called as ambaadi in marathi and ambada in urdu and gongura in telugu and sorrel in english. 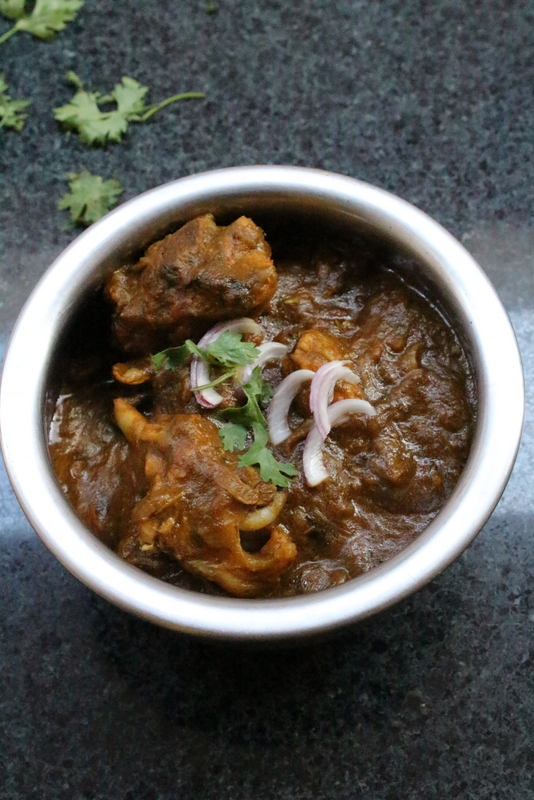 Andhra style gongura chicken recipe made with sorrel leaves and chicken. Firstly, take a pressure cooker, add gongura leaves into it. Add slit green chiilies, add coriander leaves, add chopped onions, add chopped tomatoes into it. Add little water into, add oil into it. Pressure cook the gongura leaves for about 4-5 whistles on high flame. Blend the cooked gongura into a fine paste and keep it aside for later use. Add chopped onions, add slit green chillies and saute until the onions get soft(not brown). Add ginger garlic paste and saute to get rid of raw smell. Add the chicken pieces into it, mix and roast well. Add salt, red chilli powder, turmeric powder, mix and cook for about five to ten minutes by covering the lid on medium flame. Add the gongura paste that has been blended and kept aside. Mix the gongura chicken well. Add coriander leaves into it. Add garam masala powder, add coriander seeds powder, mix well. Cook the gongura chicken by covering the lid until chicken gets tender or for about 15 minutes. Serve hot with bagara rice or steamed rice!!! Try rubarb instead as its sour too. Delicious… Tried cooking it and the end result was excellent… just love it a lot.. Thanks for the lovely feedback…hope you like our other recipes too…. I don’t have a pressure cooker. Is there an alternate method for cooking the gongura? Can you prepare & freeze the gongura paste for future use? Yes, indeed you can. Just boil and thoroughly cook gongura leaves with a few drops of oil and salt and condense it into a paste. Put in freezer bags and store. I love gongura and my mum regularly sends frozen packets from India this way 🙂 Hope this helps. How many pounds/grams are in 1 bunch of Sorrel leves or how much does this recipe require in weight?